All That Is explores a life unfolding in a world on the brink of change. Philip Bowman returns to America from the battlefields of Okinawa and finds success in the competetive world of publishing in postwar New York—yet what he most desires, and what eludes him, is love. Here is PEN/Faulkner winner James Salter's dazzling, sometimes devastating portrait of love and ambition, a fiercely intimate account of the great shocks and grand pleasures of being alive. 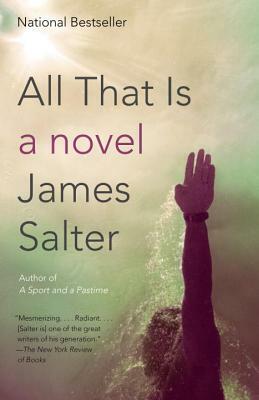 James Salter is the author of numerous books, including the novels All That Is, Solo Faces, Light Years, A Sport and a Pastime, The Arm of Flesh (revised as Cassada), and The Hunters; the memoirs Gods of Tin and Burning the Days; the collections Dusk and Other Stories, which won the 1989 PEN/Faulkner Award, and Last Night, which won the Rea Award for the Short Story and the PEN/Malamud Award; and Life Is Meals: A Food Lover’s Book of Days, written with Kay Salter. James Salter died in 2015.